Horned horses and horses with horns – they may sound anomalous (and indeed they are! ), but such creatures are certainly one and the same thing, surely? Not at all – in fact, it is true in every sense to say that they are different from head to toe(s) !! During the 19th Century, eminent French zoologist Baron Georges Cuvier loftily denounced that most mystical and magical of legendary beasts, the unicorn, as a zoological impossibility – claiming that a single median horn could never develop from the paired frontal (brow) bones of a mammal’s skull. Since Cuvier’s damning pronouncement, the unicorn has received short shrift from science. Yet this attitude may be both unjust and unjustified. To begin with: in 1934, Maine University biologist Dr William Franklin Dove successfully, and spectacularly, refuted Cuvier’s claim concerning the growth of a single median horn from the frontal bones – by creating a bovine unicorn. 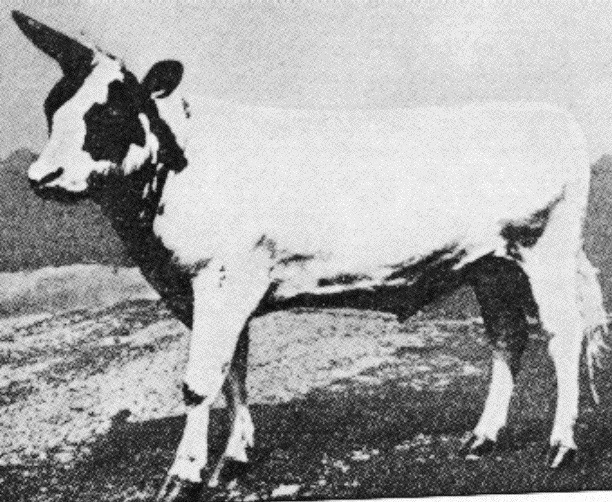 He achieved this remarkable feat by removing the embryonic horn buds from a day-old Ayrshire bull calf, trimming their edges flat, then transplanting them side by side onto the centre of the calf’s brow. 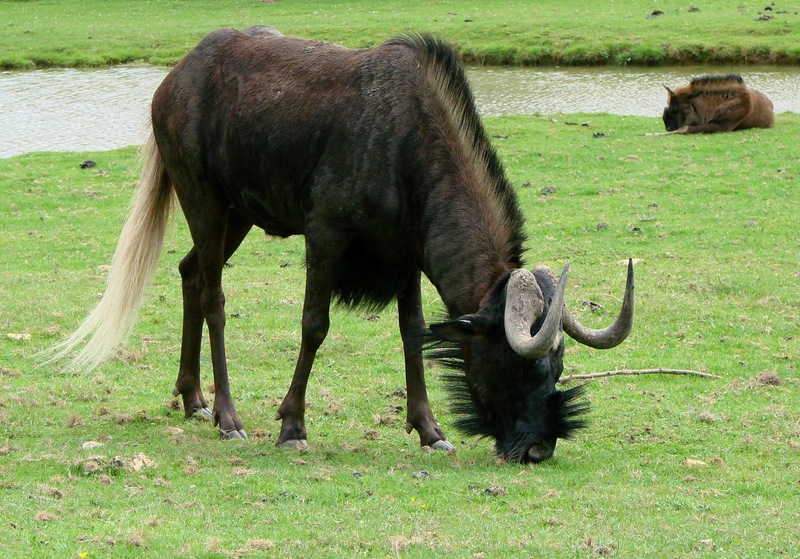 Growing in close contact with one another, the transplanted buds yielded a massive single horn, which proved so successful a weapon that its owner soon became the undisputed leader of an entire herd of cattle. Yet despite his dominance, this unicorn bull was a very placid beast, thus resembling the legendary unicorn not only morphologically but also behaviourally. Just a coincidence? 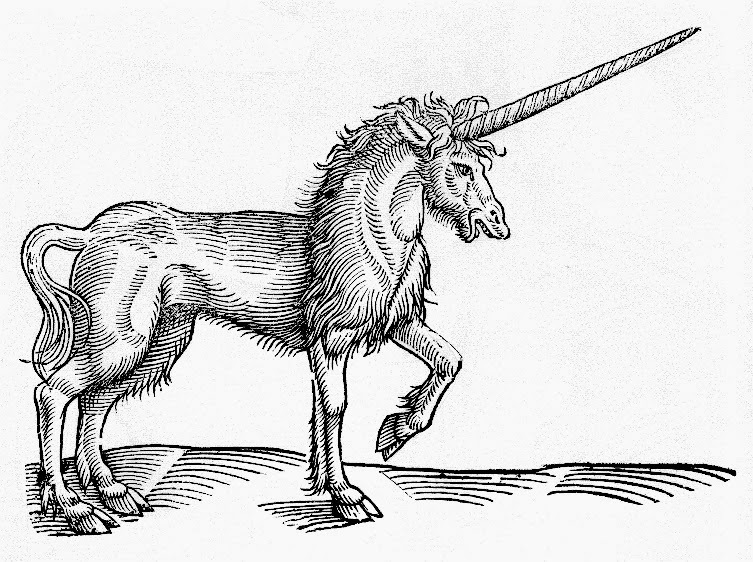 Some researchers have since speculated that perhaps ancient people knew of this simple technique, and had created single-horned herd leaders, whose imposing appearance and noble temperament thereafter became incorporated into the evolving unicorn legend. Thus, the development of a single median horn is not an impossibility after all – at least not in cattle, that is. Horses, however, must surely be a very different matter, bearing in mind that they do not even grow paired horns (let alone median ones) – or do they? In fact, records of horses with horns, though rare, are by no means unknown. In 1929, for instance, German zoologists P.P. Winogradow and A.L. Frolow published a short account within the journal Anatomische Anzeiger concerning a horse that had exhibited lateral horn development on its brow, accompanied by a photograph of the horse’s skull. Moreover, in an American Museum Novitates paper of 17 August 1934, S. Harmsted Chubb documented several horses each exhibiting a small pair of lateral skin-ensheathed frontal protuberances just above the eyes. In the photos of some such horses contained in Chubb’s paper, however, these ‘horns’ can be seen to be tightly pressed against the side of the horse’s skull, not projecting outward, away from the skull. I have heard for a fact, that, a short time ago, a horse was born in Santa Fé de la Vera Cruz, which had two horns like a bull, four inches long, sharp and erect, growing close to the ears; and that another from Chili was brought to Don John Augustin Videla, a native of Buenos Ayres [sic], with strong horns, three inches high. This horse, they tell me, was remarkably gentle; but, when offended, he attacked like a bull. Videla sent the horse to some of his relatives in Mendoza, who gave it to an inhabitant of Cordova in Tucuman, who intended, as it was a stallion, to endeavour to form a race of horned horses. I am not aware of the results, which may probably have been favorable. Thus, if horses can occasionally develop paired frontal horns and a median horn can be induced to grow from the frontal bones of cattle, then surely in this unrivalled age of biological modification, where sophisticated techniques yielding cloned, transgenic, and other man-made life forms are already commonplace, it would not be difficult to conduct a slightly modified version of Dove’s experiments – using equine-derived horn (or horn-substitute) tissue, and a foal, instead of a calf, as the recipient? Engineering a genuine equine unicorn would make a fascinating project for any zoological team capable of ignoring the sound of Cuvier turning loudly in his grave. After all, it isn’t every day that science is granted the opportunity to create a living legend. But if that is what constitutes a horse with horns, what, then, is a horned horse? I’m glad you asked! One of the most frequently reported and familiar of teratological conditions exhibited by humans is the possession of extra fingers and/or toes – polydactyly. However, this genetically-induced phenomenon has also been widely recorded among many domestic animals (e.g. dogs, cats, horses, pigs, chickens, pet rats and mice, guineapigs), as well as from wild species as diverse as bats, salamanders, leopards, llamas, and even the Malaysian flying lemur. Moreover, it can take several different forms, each under the control of a different mutant allele (gene form). Nevertheless, the teratological literature contains numerous well-documented cases of abnormal modern-day horses (notably of the Shire horse breed) that possess one or more well-developed lateral toes, often bearing their own hooves and sometimes even touching the ground alongside the normal, massive central toe’s hoof – as if determined to reverse the course of their own evolution! One such horse was an extraordinary 19th-Century specimen from Texas, which possessed a pair of well-developed lateral toes on each hind foot, curving downwards on either side of the central one like horns – as a result of which this specimen became known as the horned horse. In contrast, only one such toe, positioned on the central toe’s inner side, was present on each forefoot. It was from this specimen that other polydactylous horses also became known as horned horses, a term used in particular with specimens exhibited in sideshows, carnivals, circuses, etc. [Caesar] used to ride a remarkable horse, which had feet that were almost human, the hoofs being cleft like toes. It was born in his own stables, and as the soothsayers declared that it showed the owner would be lord of the world, he reared it with great care, and was the first to mount it; it would allow no other rider. This account and many others were included within a major paper on the subject by Prof. Othniel C. Marsh, published during April 1892 in the American Journal of Science. As Marsh noted, the extent of polydactyly exhibited by horses varies greatly. Some such specimens merely exhibit a small extra toe (often barely visible externally) on the inner side of one or both forefeet. In more notable cases, two such toes, one on each side of the normal central toe, may be present, plus one or a comparable pair on one or both hind feet (although these latter are usually smaller than their counterparts on the forefeet). In much rarer cases, however, these various supernumerary toes may be much more highly developed, to the extent that the affected feet compare favourably with the normal feet of the Miocene horse Merychippus, and even occasionally with the Oligocene’s Mesohippus. Most dramatic of all are the extremely rare examples that not only mirror the Mesohippus condition but also possess a tiny fourth toe, representing the ancestral pollex (thumb) or hallux (big toe). 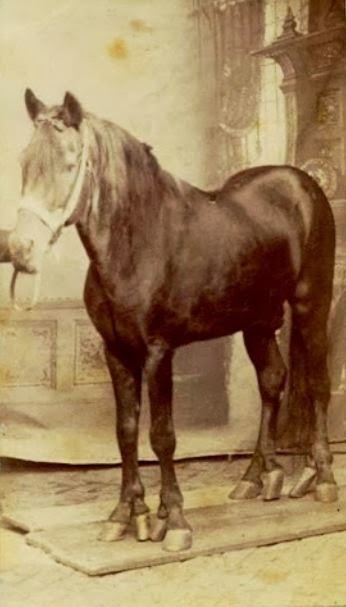 The most celebrated example of this last-mentioned and very extreme equine polydactylous state is the so-called ‘six-footed’ horse owned by Theodore F. Wood of New Jersey and named Clique, who was exhibited at shows for many years in the U.S.A. and elsewhere. Clique died at an advanced age in January 1891, whereupon his owner presented his body to Prof. Marsh for the Yale Museum. Marsh observed that whereas his hind feet were basically normal, each of Clique’s forefeet sported a well-developed toe on the central toe’s inner side. For much of its length, this extra toe was separate from the central toe, bore its own long hoof, and actually made contact with the ground, so that each forefoot appeared double. This explained Clique’s ‘six-footed’ appellation, because on first sight he seemed to possess two hind feet and four forefeet. In addition, close observations revealed that another supernumerary toe was represented by a splint-like structure on the outer side of the central toe on each of Clique’s forefeet, whereas just under the skin in the locality of the ancestral pollex a similar splint could be felt that corresponded to a fourth toe! 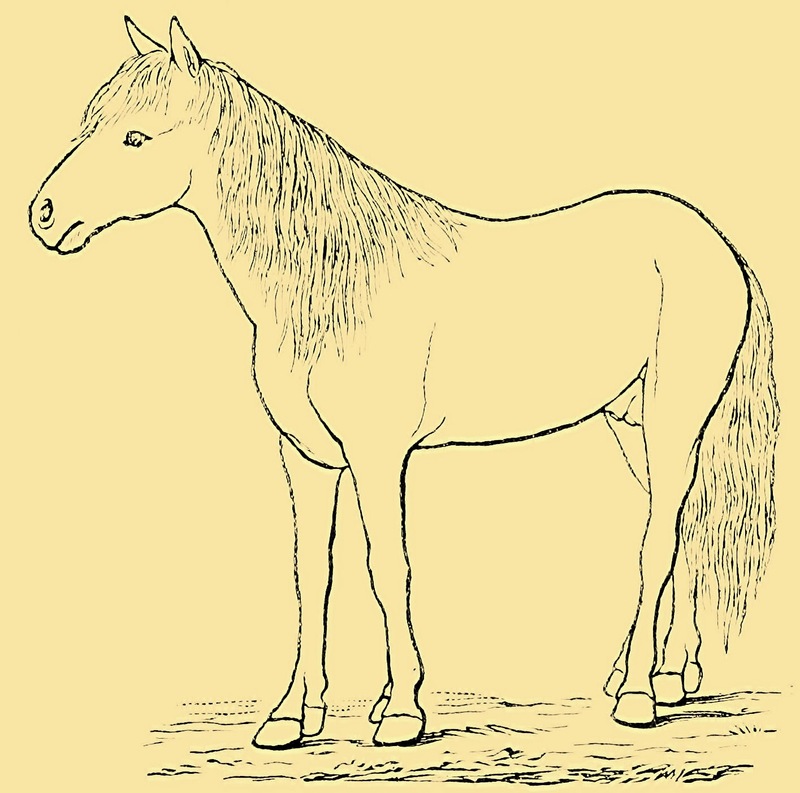 Even more remarkable than Clique, however, though less famous, was a so-called ‘eight-footed’ Cuban horse depicted in Marsh’s paper and reproduced below here in the present ShukerNature post, which gained its name from the fact that all four of its feet each bore a well-developed second toe on the inner side of the normal central toe, one again bearing its own hoof and making contact with the ground alongside the latter. This horse, a male, was on exhibition in New Orleans during spring 1878, and it was Dr Sanford E. Chaillé from that city who drew Prof. Marsh’s attention to it. The horse was subsequently brought to the North, and a few days later was displayed at New Haven, Connecticut, where Marsh closely examined it. As with the occasional reappearance of dew-claws on the hind feet of dogs, polydactyly in horses involves the redevelopment of toes normally absent in modern-day species but present in ancestral ones (rather than simply involving the duplication of existing toes, as occurring, for example, in polydactylous humans and cats). 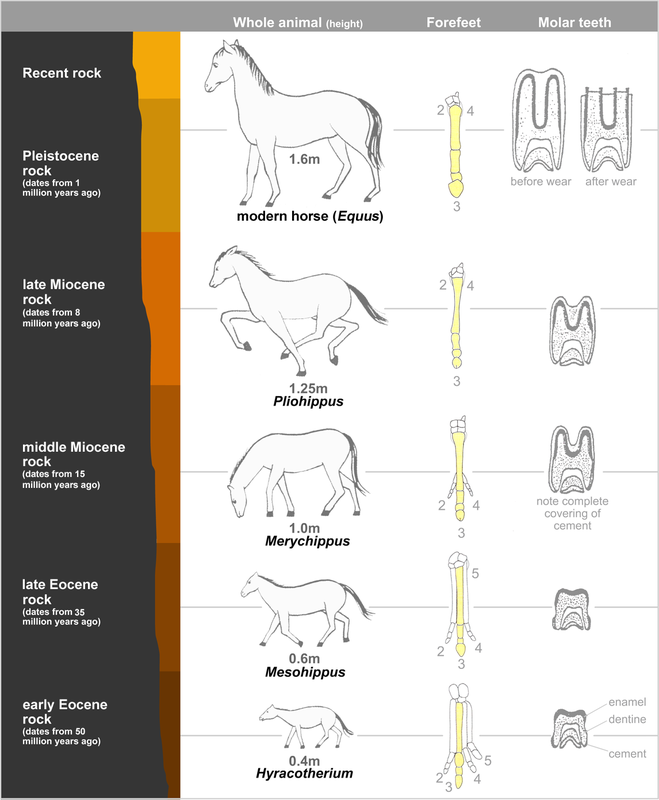 A plausible explanation for this type of polydactyly is that during the evolution of the horse, the genes responsible for the formation of all toes other than the central one became increasingly repressed by other genes, whereas those responsible for the central toe actually intensified their activity, so that eventually the latter was the only toe that was ‘permitted’ to form. Applying this theory to modern-day polydactylous horses, it could be argued that during their embryonic development something goes wrong with the repression mechanism acting upon the genes responsible for the formation of those ancestral toes, so that it fails to operate, with the result that these ostensibly ‘lost’ toes reappear – conjured forth as if by magic from their prehistoric past. According to a very beautiful colour painting portraying it (above), a bona fide eight-footed horse (i.e. one that possessed two entirely separate feet on each leg, not just supernumerary toes) was owned by Mark Sittich von Hohenems, Prince-Archbishop of Salzburg (1574-1619), who was renowed for his collection of rare and unusual animals. The horse had been obtained in Arabia, each of its alleged eight feet possessed its own horseshoe in the painting, and the painting itself is on public display at the Palace Helbrunn (now a museum), situated between Salzburg and Untersberg, Austria. Whether or not the horse was truly eight-footed, however, or whether the painting is merely a very imaginative depiction of a horned horse comparable to the Cuban specimen documented earlier here, is unknown. 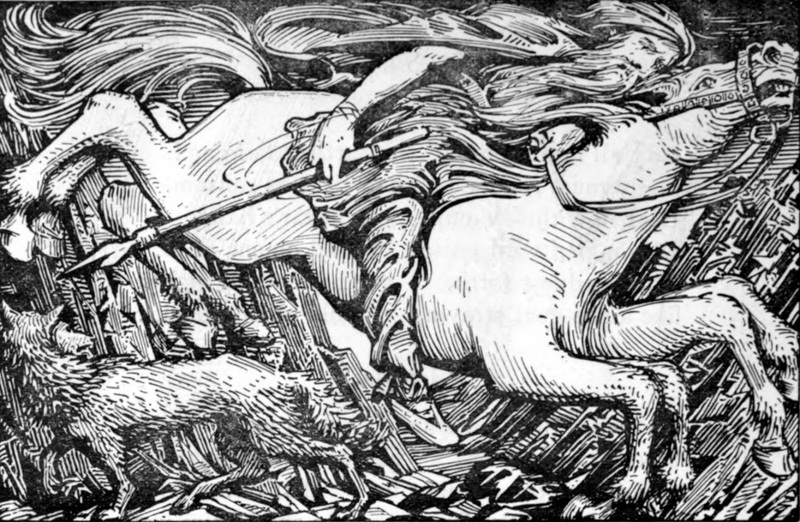 Whenever talking about eight-footed horses, one cannot help but be tempted to think of Norse mythology and Odin’s famous eight-footed steed, Sleipnir – but there was one fundamental difference between Sleipnir and the horned horses documented here. Not only did Sleipnir have eight fully-formed feet (not just extra toes that looked a little like extra feet), he also had eight legs! One last comment, just to add a further level of confusion to horses with horns and horned horses: sometimes, again most especially in sideshows, circuses, and suchlike, ‘horned horse’ is a term that has been applied to a gnu or wildebeest – this large African antelope (which actually constitutes two very closely-related species) does look superficially equine but possesses a pair of very noticeable horns.